What would it mean to your business if we could increase your repeat sales and keep your clients happy while providing you with time saving data collection tools that eliminate paper? The iSURVEY App has been made for Apple and Android devices. 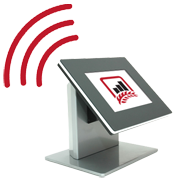 Display multiple questions on a single screen with beautiful graphics and text. It's the ideal mobile data collection tool. Conduct a survey on one or hundreds of devices. Fast survey and form creation on the web. Create your surveys and forms using the intuitive Web interface with device preview. 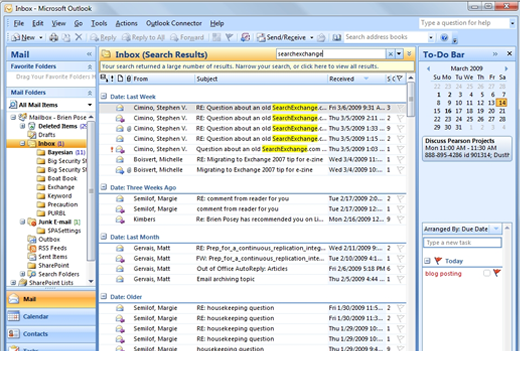 The easy drag and drop interface makes re-ordering questions and answers a breeze. There is no software required to be installed on your computer. You don’t need an Internet connection to conduct surveys. The iSURVEY app stores thousands of results on the device until you connect via WiFi or 3G and tell iSURVEY to upload the results. You can choose to upload results from devices at your convenience. Load multiple offline surveys onto a single device and quickly select between them while in the field. Your results can be up uploaded and analyzed as quickly as you want. A standard account uploads results to the cloud. The new Harvest Your data enterprise account enables you to upload your results directly to your own server and is ideal for surveys that contain personal information. No more waiting for the data entry from paper forms. You have the option of automatically uploading results from devices if an Internet connection is available. 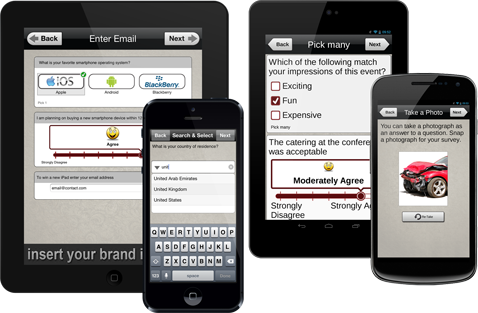 Instantly find out the outcome of your mobile questionnaire. All accounts include enterprise level management tools for users with a large number of devices. 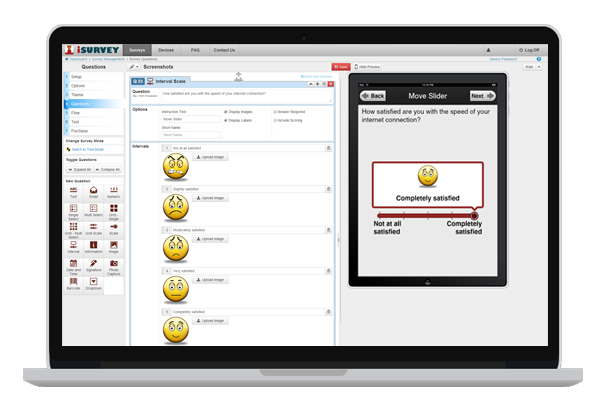 It’s quick and easy to assign surveys to multiple devices, group and filter your devices. You can set up your survey to record time stamped GPS co-ordinates for each survey result. The survey GPS co-ordinates can be downloaded and mapped using Google maps. You can set up iSURVEY to detect when a user answers a question in your survey or form that matches your Hot Answer criteria. If an uploaded result matches your Hot Answer, the results are emailed to your email notification address. 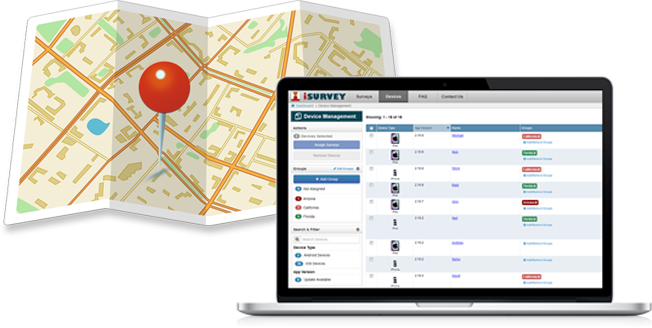 Your respondents will love iSURVEY because it is a new and interesting way to complete surveys. Download your results in the widely used CSV (comma separated value) file format. The results are directly viewable in Microsoft Excel which reads CSV files. The SPSS gurus can download their results in the SPSS native format. 19 question types including phone capture, electronic signatures and barcode scanner. Set up custom background images, font sizes / colors, radio buttons and checkbox color themes. Download your results in the widely used CSV (comma separated value) or SPSS file format. 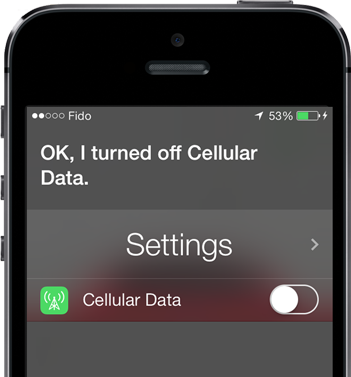 Collect data offline without the Internet. Upload results from devices at your convenience. Set the flow from question to question depending on the answers given. Manage one of hundreds of devices with ease. Surveys include access for unlimited devices. Record GPS longitude and latitude co-ordinates of your survey device. View your real time survey results using charts. Customize layouts, fonts and logo branding. The drag and drop Web interface includes a simulated device preview. Use your iPad as a kiosk. The Kiosk survey form automatically restarts after a period of inactivity. Receive an email notification when an interviewee answers a question that has been marked as a Hot Answer. The app supports Arabic, Chinese, Danish, Dutch, Finnish, French, German, Italian, Polish, Portuguese, Spanish, Turkish and English. Email a result in a PDF format directly from your Apple or Android device. Use the Developer API to integrate other business and productivity software. Apps available for download for both Apple and Android Devices.